As you follow state Route 133 toward the coast, the land opens up. Behold Laguna Canyon, where miles of undeveloped property lie untouched, as they have for hundreds of thousands of years. The area is one of the last pristine, untarnished passages from the hills to the sea in all of Southern California. But it wouldn’t be preserved the way we know it now, had it not been for two determined locals who inspired the battle for its conservation. In the 1980s, Jerry Burchfield and Mark Chamberlain, photographers and friends who opened BC Space Gallery on Forest Avenue, saw a specter of development in the canyon and wanted to stop it in its tracks. 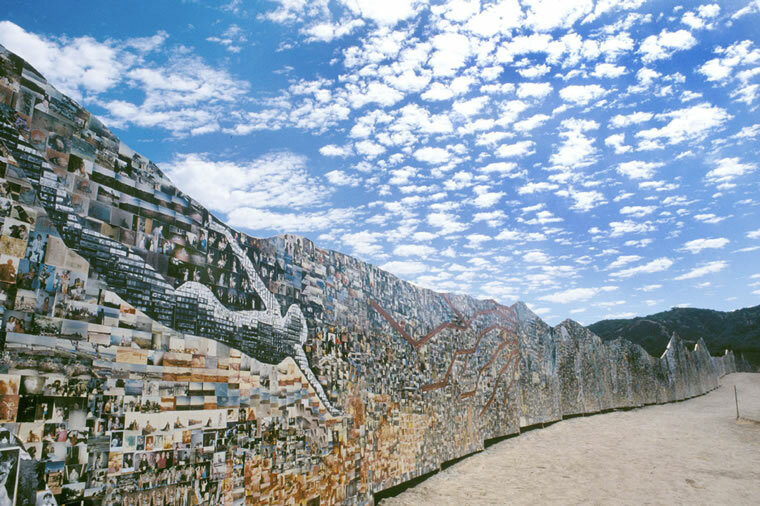 It was at BC Space that the Laguna Canyon Project—a unique blend of art and activism, or “artivism”—was born: Over the course of 30 years, the pair used photography to draw attention to the importance of the canyon as part of the identity of Laguna Beach. Now, their efforts are being highlighted in “Laguna Canyon Project: Defining Artivism,” a book due to be published within the next year by Laguna Wilderness Press. This fall, Laguna Art Museum also pays homage with “The Canyon Project: Artivism” (Oct. 18 to Jan. 17, 2016), an exhibition featuring photography, assemblage, documents and ephemera related to various phases of the project. Mark, whose early days in Laguna Beach included the famed Christmas Happening concert in 1970 in the canyon, can point to plenty of other examples of rapid development from Orange County’s inland to the coast. Consider, for instance, Crown Valley Parkway in nearby Laguna Niguel and Mission Viejo. 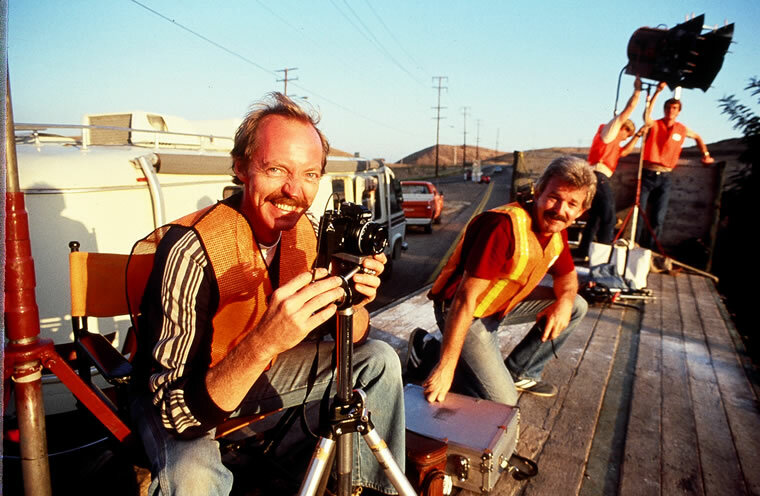 In subsequent phases—aided by a handful of other artists and activists—the pair continued to document Laguna Canyon Road at the beginning of each decade. In addition to rolls and rolls of daytime scenes, they developed hundreds of nighttime photos. They also took a crew out at night and “painted the canyon” with red, green and blue light, and captured that on film. But what started as photographic documentation grew into an ever-evolving work of performance art that would attract nationwide attention—just nine years after the initial phase, Jerry and Mark would take their “artivism” to the next level in light of impending developments in the canyon. In 1989, plans were rolling to start construction on Southern California’s first toll road. Blueprints were also drawn for the approximately 3,200-unit Laguna Laurel housing project, to be built by the Irvine Co. in Laguna Canyon, in addition to other commercial developments and a golf course. Observing all the commotion, the organizers of the Laguna Canyon Project felt compelled to action. 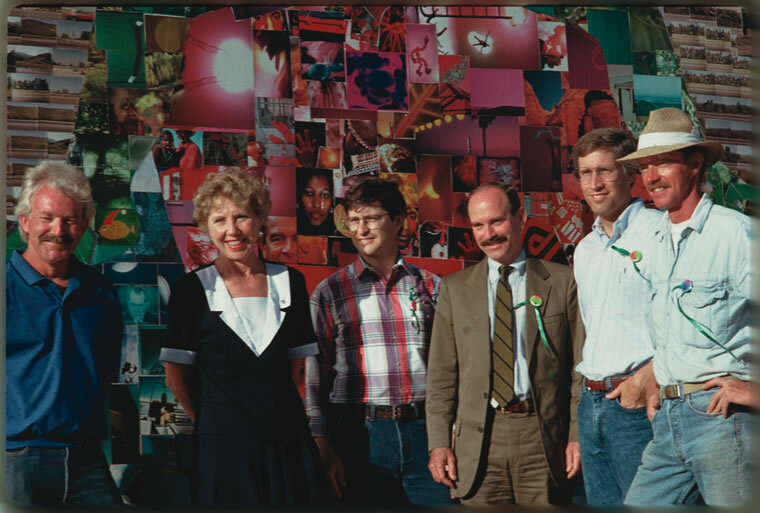 That year, Jerry, Mark and a growing crew of volunteers constructed a large outdoor mural supported by an extensive wooden frame, stretching nearly 5 miles into the canyon across from the proposed housing project. The curves and undulations echoed those of its surrounding environment, and an Easter Island head served as a focus and foundation. The decorations would be photographs—hundred of thousands of them, to be contributed by locals, passersby, whoever wanted to add to the collection. 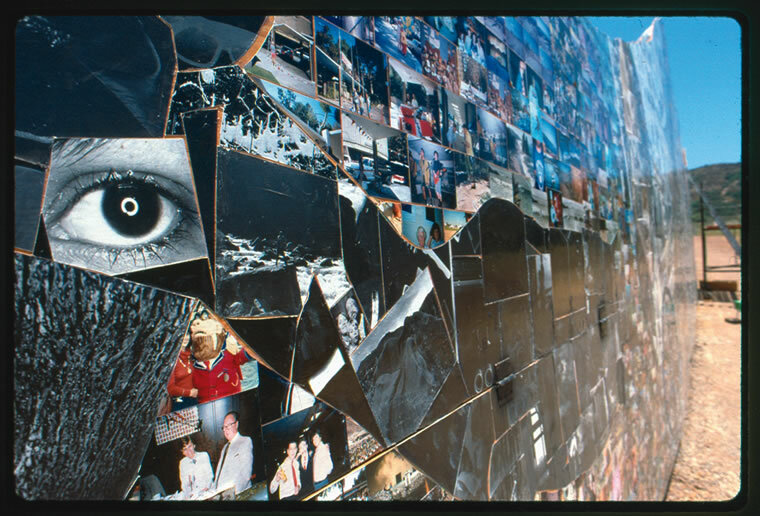 The mural evolved into “The Tell,” a collaborative photographic piece that reflected concerns about the preservation of Laguna Canyon, and the everyday lives of its contributors. At its height, “The Tell,” which borrowed its name from an archaeological term for a mound of artifacts left over from previous civilizations and buried by natural elements, stretched 636 feet long and more than 30 feet high. It was covered with about 100,000 photographs of people, places, pets, homes and trips, donated by people from across the country. “I was really impressed,” says Mike McGee, who visited “The Tell” in its heyday. 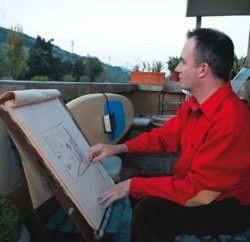 Mike, a California State University, Fullerton art professor and director of the college’s Begovich Gallery, is curating the Laguna Art Museum exhibition about the project. 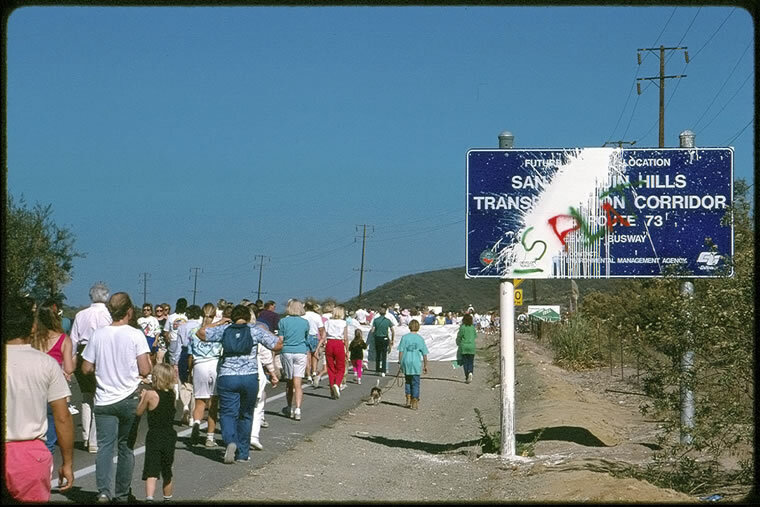 On Nov. 11, 1989, roughly 8,000 people walked from downtown Laguna Beach to the site of the photomural in the march to save Laguna Canyon. At “The Tell,” participants demonstrated against the proposed Laguna Laurel housing project and other developments planned for the area. The protests and media coverage caught the attention of the Irvine Co., which eventually agreed to release the land to the city of Laguna Beach. In 1990, residents voted to tax themselves to help pay for the purchase of the land and keep it as preserved, open space. Many more phases of the Laguna Canyon Project followed, with the final documentation completed June 21, 2010, in memory of Jerry, who had cancer and died in September 2009. But the legacy of the project, and its extraordinary blend of art and activism, lives on. “The Tell” didn’t stand for long—it was disassembled in 1990—but the new Laguna Art Museum exhibition gives visitors the opportunity to get an idea of what it felt like to contribute to such an effort. Curator Mike says he aims to reconstruct the tale of “The Tell” with a computer program that will project images sent from participants onto a scaled replica of the photomural.